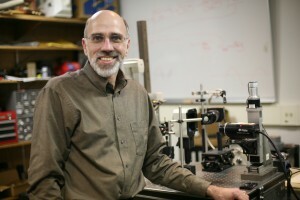 Tom Huber in his research laboratory. The award is funded by the Major Research Instrumentation Program Recovery and Reinvestment (MRI-R2), which is an initiative of the American Recovery and Reinvestment Act of 2009. This program is one facet of the NSF’s commitment to strengthen the research infrastructure at the nation’s science and engineering research and education institutions. The new vibrometer will serve as the centerpiece of a new cyber-enabled acoustics laboratory that will not only benefit Gustavus students and faculty, but collaborators across the country. In April, Huber received a three-year $220,000 NSF grant to study the use of ultrasound to excite vibrations in microcantilevers that are less than a third the width of a single strand of hair. The new vibrometer enable much greater sensitivity for detecting vibrations of these microcantilevers that are used as physical, chemical, or biological sensors. The new vibrometer and acoustics laboratory will allow Gustavus students and faculty to research and study a broad span of acoustic and vibration topics, with another major goal being the study of the physics of musical instruments.